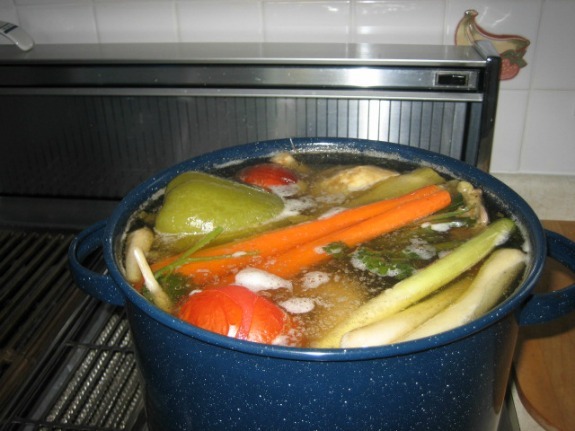 This vegetable broth recipe is not only healthy, but it is inexpensive and simple to make. This is a great way to use up any vegetables that you have left over in your fridge. No more guilty feelings about having to throw out produce that didn’t get used up through the week. They can be used if a little wilted but avoid using them if they are starting to go bad. The ingredients listed below makes a great stock but you can add any other veggies that you would like to use up. Depending on what you like, what you have left over in your fridge or what is on sale at the supermarket you can add practically anything such as mushrooms, potatoes, turnips, spinach, cauliflower, broccoli, zucchini, Brussels sprouts and fennel bulbs. Quite honestly the possibilities are endless. Beets are very healthy but I would avoid adding them to the broth unless you don’t mind a red colored stock. Leeks are delicious, but these over sized looking green onions must be cleaned well as sometimes dirt is hidden between the blades. You can leave the carrots whole if you wish as they can be eaten later as a side dish because 2 hours of simmering is not enough to make them mushy. Totally your call, but I remove them whole and enjoy eating them later as a serving of veggies with almost any meal. If you have time, chop the vegetables into large chunks, so the flavor and vitamins infuse into the water easier. If you are in a rush, feel free to place all the washed produce in whole and simmer a ½ hour longer. Place all ingredients into a large soup pot and add water. Bring broth to a boil, then turn down heat and simmer for about 2 hour stirring occasionally. Remove pot from heat, let the liquid cool down and then strain into a clean container. Vegetable broth will keep in the refrigerator for 5 days or months in the freezer. This stock is great for vegetarian lovers and can be added to many recipes for flavor and added nutrition.